The city of Mt. Angel, best known for throwing Oregon’s largest Oktoberfest, was incorporated on April 3, 1893. White settlers began arriving in the area about 40 years earlier. In 1891 a group of Benedictines arrived and started an abbey on the hill, which they christened Mount Angel (the translation of Engelberg, the location of their home-abbey in Switzerland). 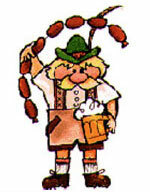 In 2009 the Oktoberfest (a tradition in the small town since 1966), was joined by an winter festival: Wurstfest – a celebration of the mighty German (wurst) sausage. I’m a fourth generation Mt. Angelian. It’s a great place to visit and be from.